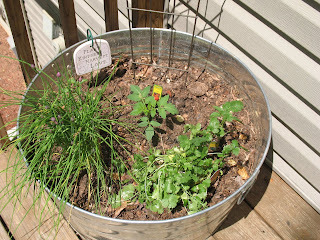 This year I planted a little salsa garden in a big metal planter on the deck (the only place in our yard that gets enough sun to grow things). Tomato, jalapenos, bell pepper, chives, and cilantro. On Monday I picked my first bell pepper (and so far my only bell pepper). It was about the size of a golf ball :( Poor little thing. But I cut it up and made quesadillas. Yum! Today I picked my first Roma tomato! 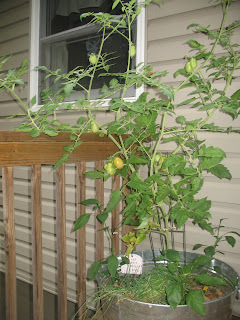 The tomato plant is huge... we are going to be making lots of salsa, pizza sauce, and guacamole, I hope! As for the cilantro plant, well, I used it all up the first part of the summer and now I can't find a replacement. :( Boo! The jalapenos are holding their own and have finally decided to flower. Perhaps they will produce some peppers, after all. :) I also have a little basil plant that is flourishing. Can't wait to make pesto and Margherita pizza! Michael also enjoys this little garden, because instead of me talking about typical garden-y things like trimming the azaleas, bugs on my hostas, and what to plant where, I keep talking about all this good food I'm going to make! We have hopes to clear the land in our back yard beyond the woods and have an even bigger landscape garden sometime in the future. I have learned a lot of lessons this year from my little garden and next year I intend to make it bigger and better in containers on the deck railing. More room for them to grow, more sun and easier to move around. I can't wait! Happy Summer harvest!